Tim was once again working closely with director and editor Steve Griffithsfrom production company VisionLink to produce the videos. 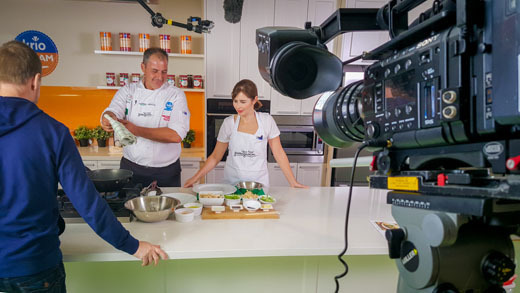 “Tim’s knowledge and expertise and easy going nature ensured the shoot went smoothly, which is crucial, given we have to work really fast, shooting eight dishes being prepared per day,” Steve says. Both Steve and Tim enjoy shooting the process – and tasting the different meals. Shot in a professional test kitchen in Botany, this project looks to be ongoing – so watch this space for more cooking inspiration. In fact, the client is so happy they have just commissioned series 4. The aim of this project is to encourage the increased use of seasonal vegetables in the everyday Aussie home. This practice is good for the environment, good for the family budget and for general health and wellbeing!